Unequal Scenes is a drone-based art project alerting people to the yawning divides in many societies around the world due to inequality. 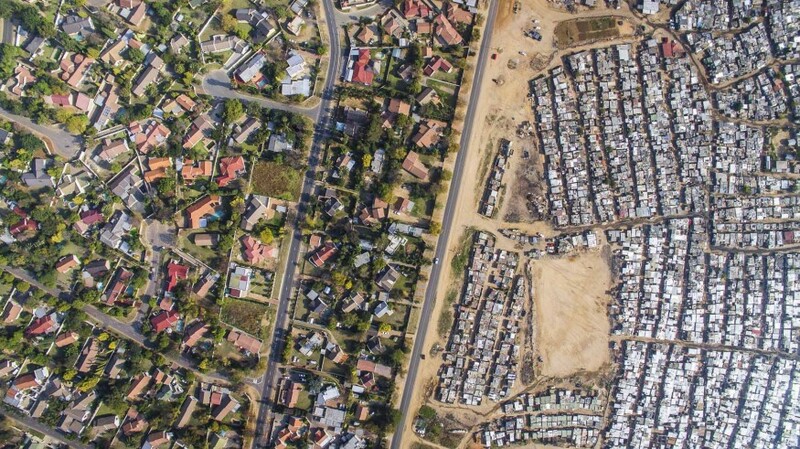 Unequal Scenes locates the dividing lines in the world’s most unequal societies. Using drone imagery, the project showcases these divisions from the air, but also through portraiture, essays, and interviews on the topic of inequality. The project began in various cities in South Africa, but has since spread to 5 other countries (Kenya, Tanzania, India, USA, and Mexico) where inequality is the most stark. The idea came as a way to quickly communicate the radical divisions that inequality engenders, through a defining aesthetic that is easily shared and understood. The project has spread rapidly via social media, amongst other types of media, because of its appeal as an easy to understand motif, but also due to the topical nature and the partners involved with the project. Unequal Scenes has had great impact on civil society organizations, governments, academics, and other parties interested in communicating the problem of inequality. Organizations such as the UN, OECD, WEF, SA Government, Oxfam, Greenpeace (and more) have used the images to illustrate inequality successfully for their various policy positions. Academic institutions such as the London School of Economics, the University of Cape Town, the University of Richmond (and more) have used the images as course material, marketing for inequality study programs, and even as inspiration for student projects. Exhibitions in various community spaces around the world have exhibited the artwork, organizations have held co-creation events (with community photographers), and dozens of discussions related to inequality issues due to the photo series have taken place. The project began in 2016 by photographer Johnny Miller, with financial and logistic support from Code For Africa and the Atlantic Fellowship for Social and Economic Equity. Equity based at the London School of Economics.